Light therapy refers to two different categories of treatment, one used in mainstream medical practice and the other in alternative/complementary medicine. Mainstream light therapy (also called phototherapy) includes the use of ultraviolet light to treat psoriasis and other skin disorders, and the use of full-spectrum or bright light to treat Seasonal Affective Disorder (SAD). Light therapy for SAD was first introduced in the 1980s and is now a widely approved form of treatment for the disorder. 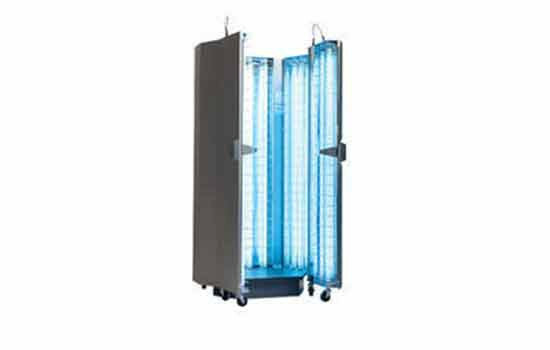 In phototherapy, UV irradiations are used for the treatment of skin disorders. In Dermatology UVB (290-320nm) or UVA (320-400nm) irradiation is used. UVA rays are used after administration of psoralens (PUVA). Photo-chemotherapy depends on treatment with drugs that reacts to ultraviolet radiation or sunlight. PUVA is a photo-chemotherapy treatment used to treat severe skin conditions as psoriases and other dermatoses. PUVA is a combination of Psoralens (P) and Ultraviolet A (UVA) radiation. Psoralens are photosensitizing agents (light activated drugs) found in medicinal plants. The drug delivered by psoralens is taken 2 or 3 hours before ultraviolet a treatment session. When absorbed by the body it has the opposite effect of sunscreen. It makes the skin cells more susceptible to UVA light. Dosimetry is essentially how much radiation exposure you get from substances or machines that produce radiation. The dose refers to the amount of energy in joules delivered.